Many thanks to Jeremy Spikes, who received some beers from one of his clients and decided that I was worthy of sharing with. 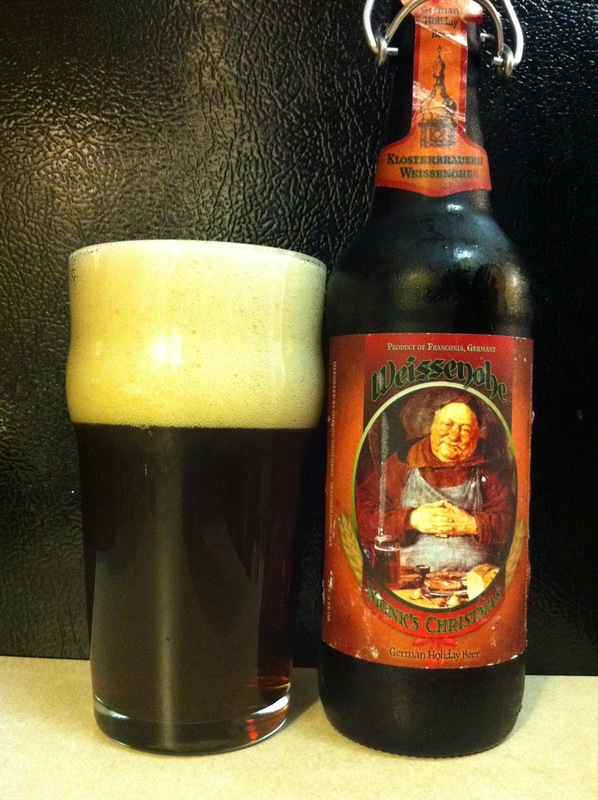 One of those that he had was one I hadn't tried before, the Monk's Christmas from the German brewery Klosterbrauerie Weisenohe. Haven't heard of that brewery? Yeah... well until then I hadn't either, and as far as I know this is the first beer from them I've ever seen. I do know that they have a website, but it's all in German and I don't really speak German past 'danke', 'bier', and 'brauerie.' They are a Bavarian brewery as best I can tell though... and I do typically like Bavarian beer, so let's dive in. I poured from the 16.9 ounce flip-top into an imperial pint glass... can't go wrong with that extra 4.9 ounces! (For those curious, 16.9 ounces = .5 liters, and they use the crazy "metric system" over in Germany.) It's a deep red color with a huge slightly off-white head. Pretty good retention and lacing... not bad considering this one has probably not been stored properly. Of the three bottles two were missing labels, so that indicates a lot of humidity to me. It's got a pretty nice sweet malty aroma, lots of caramel and a little honey. The taste is a little thin, with basically the same malt profile. It's tasty but weaker than the aroma. Still a very nice beer and for a free one, I'm not bitching! The mouthfeel is a little thin, but it's still good. I'm liking this beer, pretty decent overall. Thanks again to Jeremy for sharing, always nice to try something completely new including the brewery.